Art installation made from 168,000 used plastic straws. 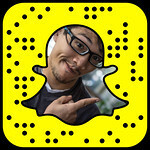 Sounds like a cliche little quote – but these little things really do add up. Straws are virtually impossible to recycle in most places around the world because of how light and small they are. They’re also one of the easiest products to turn down at a bar, cafe or restaurant. With a truckload of plastic flowing into the ocean every 60 seconds, it’s easy to feel overwhelmed – but I’ve always believed that its less about what we can’t do, and more about what we can do – even if it’s something as small as saying “No Straw please”. For my latest project, I wanted to encourage people to turn down their next straw by creating a “strawpocalypse”. Something so large that if anybody walked by, they couldn’t help but ignore. But first, I was going to need straws. A lot of them. At just 10$ for 100,000 straws, it would have been super convenient to buy a ton of them and figure something out – but that was clearly not an option. 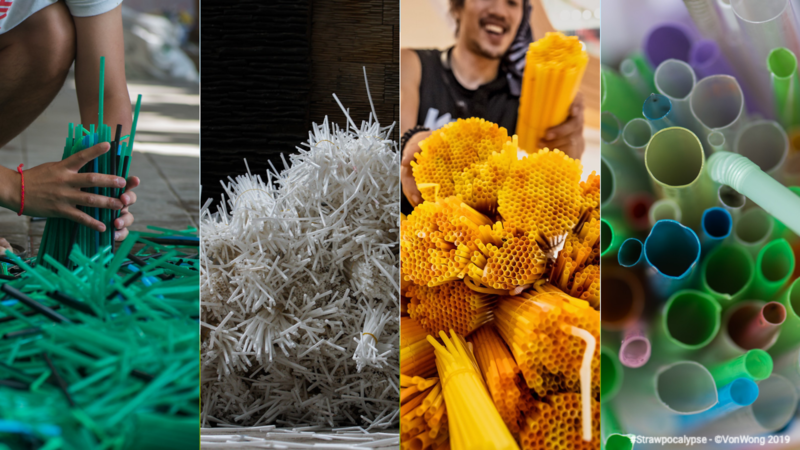 Zero Waste Saigon stepped in and offered to help, and with the help of Starbucks Vietnam and hundreds of volunteers – spent over 6 months to gather a total of 168,000 straws to bring this project to life. 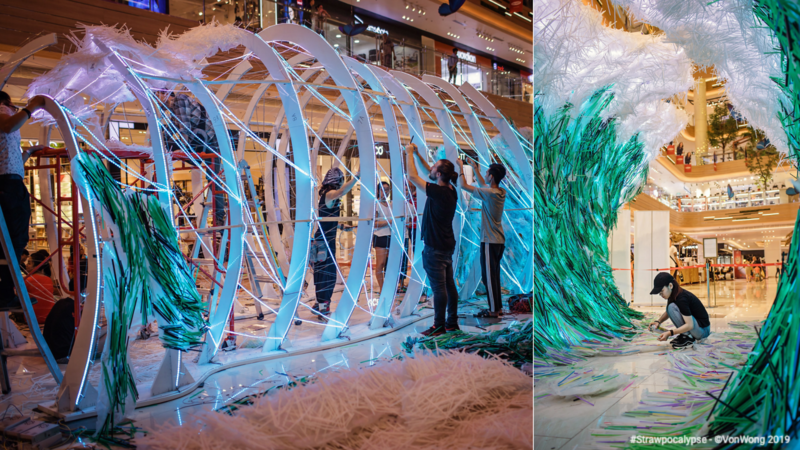 The result: A 3.3m (10 ft+) tall art installation representing the Parting of the Plastic Sea. The installation is currently in Estella Place, Ho Chi Minh City until March 24th, 2019. It is looking for a new home. If you’re a company, institution or museum interested in sponsoring it: please let us know. Our hope with this installation is that each and every person feels empowered to take a step towards using their last straw. It took us almost two weeks of work to clean, organize and prepare our straws to build “The Parting of the Plastic Sea”. 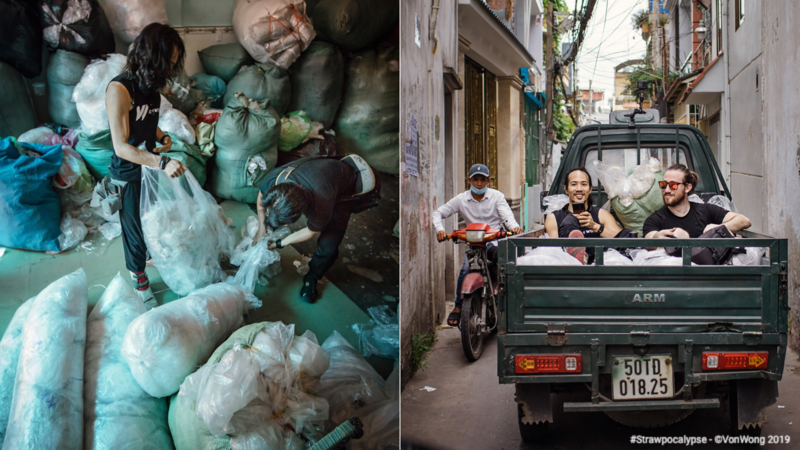 The entire project began with a Facebook conversation when Julia from Zero Waste Saigon reached out to me and asked if I would collaborate with them if they helped me collect all the trash that I wanted. 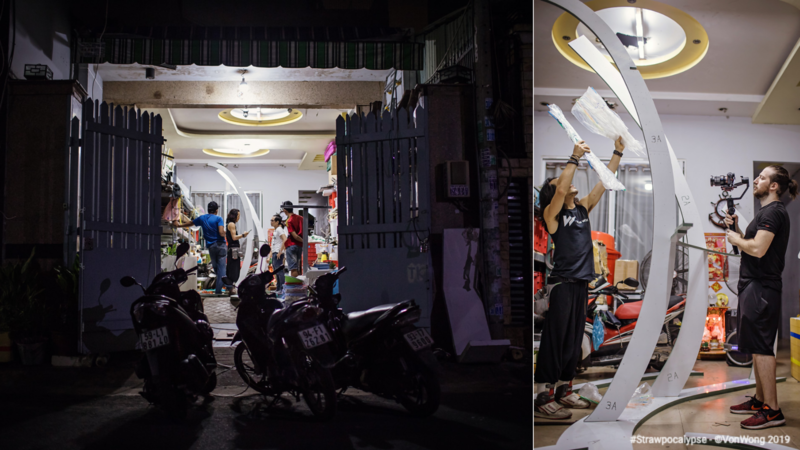 After Starbucks Vietnam came on board as a sponsor, all that remained was to figure out how to transform our idea from Concept to Reality. Straws were organized by color, to represent different parts of the wave. Green/Blue/Black for the base of the wave, White for the froth on top, Orange/Yellow for the sand and all other transparent ones as transition points in the structure. 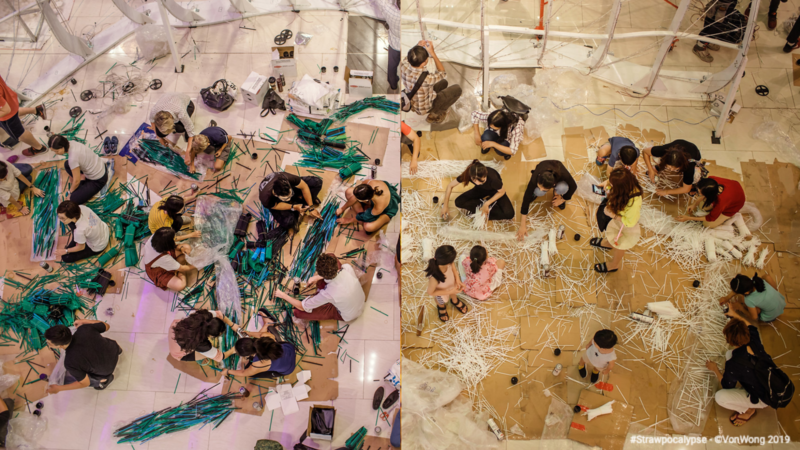 With the help of our volunteers, we collected used plastic bags for our installation. 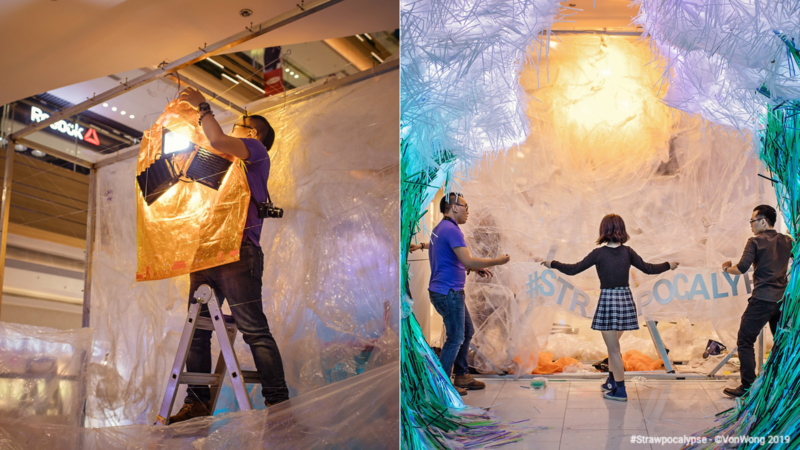 The plan was to use clear plastic bags to not only act as support for our straws but also to act as a diffuser for the LED lighting of our structure. Every day, dozens of new volunteers streamed in to give thousands of discarded straws a second life. A little assembly-line was set up and older volunteers would teach newer volunteers how to stick our straws into various different patterns to mimic the direction of the water flow. Meanwhile, we worked with a local builder to convert our idea into reality. Although we had designed the idea with the help of Nick Moser, a technical builder in SF and Stefan Suknjaja an escape room designer in Serbia – we still had to figure out where and how to build things in Vietnam. Luckily Fosha Zyang, a local set designer stepped in to help us out. 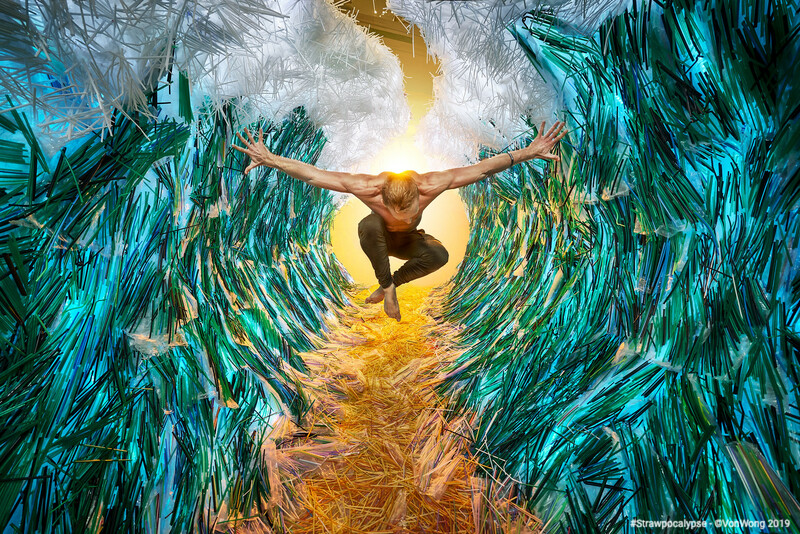 My hope was to create the parting of the sea to reveal the plastics hiding within. The plastic problem is either out of sight, out of mind – or so omnipresent that it becomes invisible. 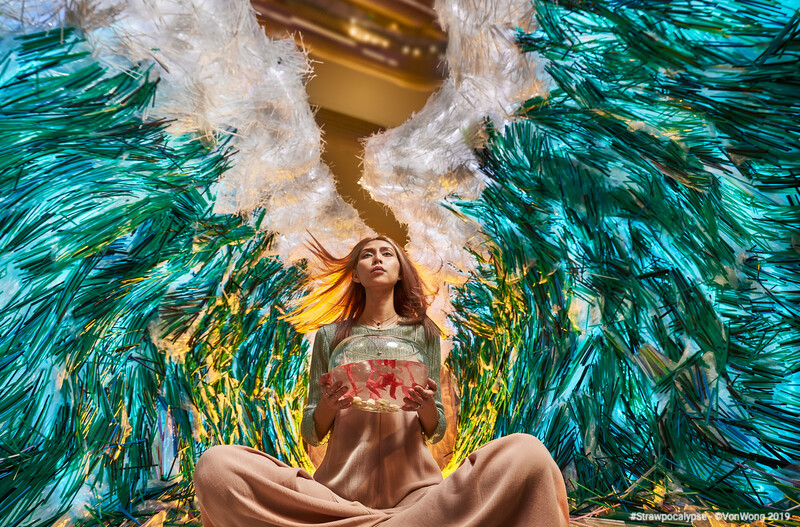 I wanted to use art to tackle both angles – by creating something beautiful and unique out of an environmental tragedy. We arranged the straws like strokes of a paintbrush, trying our best to follow the curves of the lights and waves. 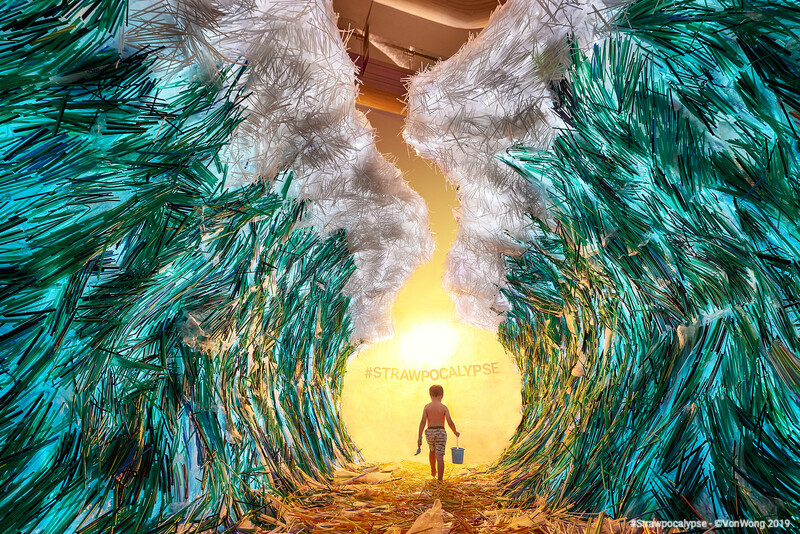 This whole time, all of us had been slaving away without knowing for sure whether or not things would look good – but as the pieces slowly fell into place, we all finally breathed a sigh of relief as the waves of plastic started coming to life. Our final touch was to add a “sun” in between the two waves, built by connecting a couple LED panels together with galvanized wire. Our installation was given a home in the atrium of Estella Place, offering a 360 view of the installation. While it was great for foot traffic and awareness – it also meant a lot of distractions so we decided to build a white “sky” of plastics, complete with an orange sun. 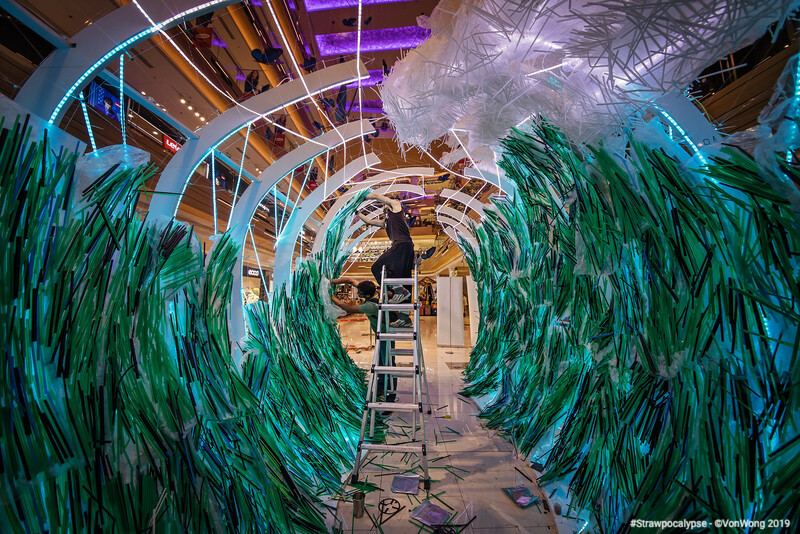 Although this installation is made from straws, it isn’t just about straws. It’s about taking a first step towards paying attention to the plastic epidemic threatening the oceans we rely on. If things don’t change by the year 2050, there could be more plastic than fish in the sea. While statistics like that can appear daunting and impossible to fight against, it all starts with small simple actions. On the 24th of March, our installation becomes homeless. We’re hunting for a company, institution or museum to adopt it! 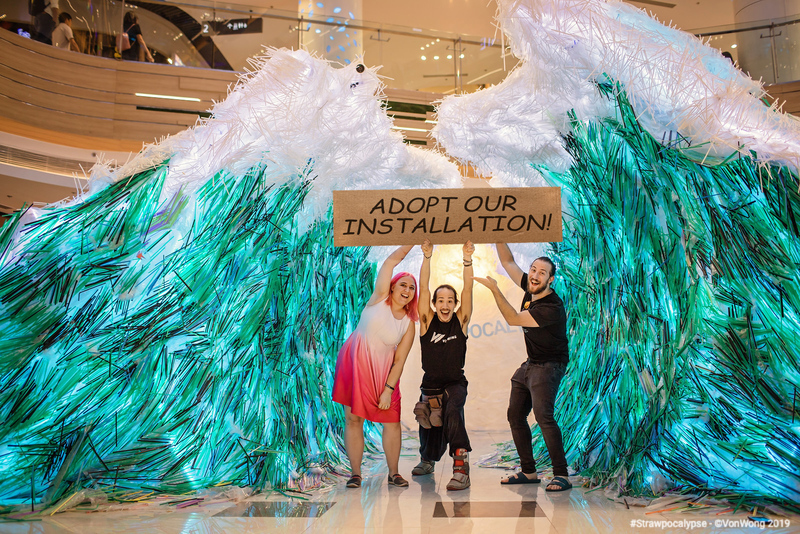 We believe that the fight against single-use plastics is going to go on for the next couple hundred years… and because of that, we hope to find a forever home for our installation. It’s obviously not going to be easy or cheap to transport – but if you know someone who believes in the cause – please let us know! Special thanks to the German International School, British International School and American International School for supporting our cleanup efforts. High-Rez press images, BTS and more can be found in this dropbox link.